Engine guru Keith Dorton helps build our Ford flathead with 3/4 race cam, high compression heads and 3 deuces. 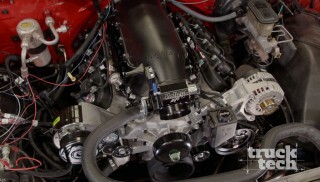 (ANNOUNCER)>> IT'S FLATHEADS FOREVER AS ENGINE POWER HOT RODS ONE OF HENRY FORD'S LEGENDARY SIDE VALVE VEIGHTS. (MIKE)>> I HOPE YOU'VE GOT A HAMMER ON THAT CART. THIS THING LOOKED BETTER IN THE JUNKYARD. (JOHN)>> I THINK IT'LL BE FINE MAN. NEW OIL CHANGE, A LITTLE 30 WEIGHT OIL IN THE CYLINDERS, IT'LL FIRE RIGHT UP WITH SOME NEW PLUGS. 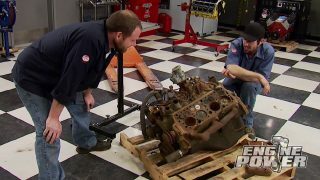 (MIKE)>> WELCOME TO THE ENGINE POWER SHOP. TODAY WE'RE STARTING A BUILD ON A FAMOUS FORD FLATHEAD. NOW WE FOUND OURS AT A LOCAL AUTO RECYCLING YARD IN AN OLD FLAT BED TRUCK. ITS AN ENGINE THAT HAS NOT BEEN PRODUCED FOR 61 YEARS. OUR PLAN IS TO BUILD A PERFORMANCE FLATHEAD THAT PAYS TRIBUTE TO THE WAY IT WOULD HAVE BEEN BUILT BY HOT RODDERS BACK IN THE '50'S AND '60'S. WHEN HENRY FORD RELEASED A NEW VEIGHT ENGINE FOR HIS 1932 MODELB'S AND 18'S, HE NEVER KNEW HE HAD JUMP STARTED AN AMERICAN HOT RODDING CRAZE. IT WAS QUICKLY EMBRACED BY GUYS WITH A PASSION FOR GOING FAST. IT WAS EVEN THE CATALYST FOR AN EMERGING EVENTUALLY FLOURISHING AFTERMARKET SPEED EQUIPMENT INDUSTRY. (VIC)>> THE FLATHEAD WAS THE ENGINE AFTER THE WAR. AND HENRY HAD NO IDEA THAT IT WAS EVER GONNA BE ACCEPTED IN THAT WAY, BUT IT WAS. VERSIONS FROM 1949 TO '53, WHICH IS THE 239 CUBIC INCH VERSION. IT HAS A THREE POINT ONEEIGHTSEVENFIVE BORE AND A THREESEVEN-50 STROKE. NOW IT MADE A WHOOPING 110 HORSEPOWER AND 194 POUND FEET OF TORQUE BACK IN ITS DAY. NOW YOU CAN STILL FIND THEM, BUT CONDITIONS MAY VARY. (JOHN)>> NOW OURS WAS OBVIOUSLY IN THE WEATHER FOR SOME TIME. BE THE FIRST PLACE WE CHECK FOR CRACKS. (MIKE)>> WE TEAR A LOT OF OLD CARS APART HERE AT THE TECH CENTER. NOW MOST OF THE PARTS ARE RUSTY, BUT THEY'RE STILL VERY VALUABLE. SO WE'RE CREATING A SOAK TUB USING WD 40'S RUST REMOVER SOAP AS A FIRST STEP IN THE CLEANING PROCESS. NOW WHILE THIS THING MAY SEEM LARGE, IT'S FOR GOOD REASON. WE'RE GONNA SOAK LARGE AND SMALL PARTS IN IT AS WELL AS OUR FLATHEAD TO REMOVE THE SURFACE RUST AND MAYBE HELP LOOSEN THE LOCKED UP ROTATING ASSEMBLY IN OUR FLATTY. WE'RE NOT REUSING THE CYLINDER HEADS, BUT THEY'VE GOT SOME VALUE TO THE. SO WE'RE THROWING THEM IN AS WELL ALONG WITH THE INTAKE MANIFOLD. (JOHN)>> NOW WE'RE GONNA GIVE THAT BLOCK SOME TIME TO SOAK. THAT'LL GIVE US A CHANCE TO GET STARTED ON OUR PARTS LIST. BUT RIGHT OFF THE BAT WE'RE GONNA GIVE CREDIT WHERE CREDIT'S DUE. EVERY BIT OF THE AFTERMARKET SUPPORT FOR GEARHEADS LIKE US NOW DAYS IS ALL THANKS TO THIS FLATHEAD VEIGHT. IT WAS THE VERY FIRST MASS PRODUCED AFFORDABLE VEIGHT, AND IT DIDN'T TAKE GUYS LONG TO START TEARING THEM APART AND DO WHAT WE DO, MAKE THEM BETTER. THE CASTING NUMBER AND VERIFY YOUR PARTS AGAINST IT. THERE'S AN EARLY AND A LATE MODEL FLATHEAD. AND AS A MATTER OF FACT, THE LINCOLNS HAD A LONGER STROKE. MAKE SURE YOU KNOW WHAT YOU'RE ORDERING SO YOU DON'T WASTE YOUR MONEY. (MIKE)>> NOW WHAT WILL BE A SHORT BREAK FOR YOU WILL BE 24 HOURS FOR THE SOAK. WE'LL BE RIGHT BACK. TACTIC OF LAST RESORT. AND LATER IT'S HOW TO FIND AND FIX BLOCK CRACKS. (JOHN)>> THAT'S GOOD RIGHT THERE. IT WAS BLUE! (MIKE)>> WE'RE BACK AND ANXIOUS TO SEE THE RESULTS OF OUR OVERNIGHT SOAK. WOW, I SEE BARE METAL IN A LOT OF PLACES. (JOHN)>> THAT'S PRETTY COOL! NOW WE'RE DOWN TO THE ACTUAL MACHINING MARKS ON THE DECK SURFACE. (JOHN)>> OH LOOK, IT'S JUST COMING OFF WITH YOUR FINGERNAIL. (MIKE)>> YEAH THE PAINT'S EVEN COMING OFF, LOOK AT THAT. THAT STUFF'S AMAZING. (JOHN)>> THAT RIGHT THERE IS 100 PERCENT CLEAN, FRESH CAST IRON. THAT LOOKS GOOD! (MIKE)>> AND AFTER A SHORT BATH WE'LL BE ABLE TO SEE WHAT WE HAVE TO WORK WITH. NEED TO FINISH UP. WITH SOME WD 40 RUST RELEASE PENETRANT AND A WELL USED HONE, WE'LL CLEAR THE WAY AS MUCH AS WE CAN. THESE RINGS AND CYLINDERS HAVE BEEN FUSING TOGETHER FOR MANY YEARS. AND THE 24 HOUR SOAK MAY NOT HAVE BEEN ENOUGH FOR THIS EXTREME CASE. ALRIGHT, I'M GONNA START PUTTING PRESSURE, HOPEFULLY I WON'T SNAP THAT CRANK. LETS SEE THE RESULTS OF OUR IMPATIENCE. NOPE, NOT YET. BEFORE WE GET PHYSICAL ON IT, WE NEED TO GET THE UNIQUE VALVE ASSEMBLIES THAT ARE MOUNTED UNDER THE HEAD OUT OF THE BLOCK. THEY'RE TUCKED AWAY IN THE VALLEY AND THE FIRST THING TO BE REMOVED IS THE VALVE GUIDE RETAINER. TO COMPRESS THE SPRING A SPECIAL TOOL WAS NEEDED. OURS CAME FROM GOODSON AND WE'LL COMPRESS IT ENOUGH TO REMOVE THE LOCKS, RETAINERS, AND SPRINGS. DON'T FORGET TO FIND ALL YOUR LOCKS. THE FLATTY'S CAM. THE REBUILD IS CONFIRMED, HAD TO BE A QUALITY ONE TOO WITH THE STAMPINGS WE FOUND ON THE RODS. EVEN THE NEW BEARING SIZES ARE STAMPED ON THE COUNTER WEIGHT. JOHN GRABBED THE CALIPERS TO CHECK THE BORE. (JOHN)>> LOOKS LIKE THREE-250, IT'S BEEN BORED. (MIKE)>> WHEN I SAY STOP, STOP, AND I WON'T LET IT COME OVER ON YOUR TOES ALRIGHT? NOW LETS SEE IF WE CAN LOOSEN THE ROTATING ASSEMBLY WITHOUT THE VALVETRAIN'S PRESSURE. SHE AIN'T BUDGING. I THINK WE'RE GONNA HAVE TO BREAK THE PISTONS. (JOHN)>> I THINK SO TOO. LET ME, THAT'S NOT HAPPENING. SEE IF WE CAN HAMMER IT OUT. (MIKE)>> WE CAN DO THAT. (MIKE)>> WE'RE OFF TO A GOOD START AND HERE'S WHERE IT ENDS. (JOHN)>> DID WE FIND THE ONE? (MIKE)>> WE FOUND THE ONE. ROLL IT UP, LETS BUST THE PISTON. I'M AMAZED THAT ANY OF THEM BROKE FREE. ONLY A FEW NEEDED A LITTLE MORE PERSUASION. SO BY CUTTING OR BREAKING AWAY THE CENTER, WE CAN REMOVE THE OUTER EDGES. A LITTLE AT A TIME. JUST BE CAREFUL NOT TO KNICK OR SCAR THE CYLINDER WALLS. YOU DON'T WANT TO BORE THE CYLINDERS ANYMORE THAN NECESSARY. (MIKE)>> CAN'T GET INTO CYLINDER OR ANYTHING. (JOHN)>> OH THERE IT GOES. (MIKE)>> I'D LIKE TO SAY THE LAST PART TO GO IS THE CRANK, BUT WE'VE GOT ONE MORE PISTON WE COULDN'T GET TO. (JOHN)>> GOT IT, I GOT IT, WE'RE GOOD. (MIKE)>> I DON'T WANT TO HAVE TO DO THAT AGAIN. THAT WAS PRETTY DIRTY. WELL WE GOT EVERYTHING OFF OF IT WE NEEDED TO GET OFF AND WE SALVAGED WHAT WE NEEDED TO, THE BLOCK, THE MAINS, THAT'S REALLY ALL WE'RE GONNA BE USING ISN'T IT? (JOHN)>> YEAH HOPEFULLY, I'VE STILL GOT TO GO TO THE MACHINE SHOP AND MAGNAFLUX IT. SO WE'LL SEE, COULD HAVE BEEN ALL FOR NAUGHT. (MIKE)>> THAT'S THE NEXT STEP, I CAN'T WAIT TO SEE IT GO. (JOHN)>> ONE MORE WASH IT IS. A MACHINE SHOP COULD HAVE REMOVED THE PISTONS FOR US, BUT WE SAVED A FEW HUNDRED DOLLARS AND GOT A BETTER LOOK AT THE BLOCK. OH MAN, THAT WAS A GREAT SATURDAY AFTERNOON. ENGINES THIS OLD AND NEGLECTED FOR THIS LONG CAN BE A GAMBLE, BUT AN OLD FLATHEAD LIKE THIS IS WORTH IT. (ANNOUNCER)>> COMING UP, OUR FLATHEAD GETS A VALVE JOB! (JOHN)>> WE'RE BACK AND ABOUT TO FIND OUT IF THIS OLD FLATHEAD IS WORTH ANYMORE TIME AND MONEY TO REBUILD. THE FIRST ORDER OF BUSINESS AFTER BAKING AND SHOT PEENING IS GONNA BE MAGNAFLUXING. THIS WILL SHOW YOU CRACKS YOUR EYES CAN'T SEE, AND IT DOESN'T TAKE LONG TO DO JUST THAT. (JOHN)>> IT'S A CRACK? YEP, THERE'S CRACK NUMBER TWO. I FOUND FIVE OF THESE. BETWEEN A WATER JACKET AND A BOLT HOLE. I BELIEVE I CAN REPAIR. THE GOOD NEWS IS THE SIDES OF THE BLOCK ARE FINE. I'M NOT DANCING JUST YET. THE CYLINDERS ARE THE NEXT BIG CONCERN. NOW IF THEY HAVE CRACKS OR TOO MUCH SCARRING, WELL IT MAY NOT BE WORTH THE COST OF HAVING TO SLEEVE IT. BORE THEM OUT IS GONNA BE THE ONLY WAY TO TELL. NOW REMEMBER, THESE CYLINDERS HAVE BEEN OPENED UP TO THREE AND A QUARTER INCHES FROM A PREVIOUS REBUILT. SO WE'LL GO TO THREE AND THREEEIGHTHS TO ACCEPT THE LARGEST PISTON MADE FOR THIS BLOCK. IF THEY ALL CLEAN UP, NO SLEEVES WILL BE NEEDED AND WE'LL HAVE A BLOCK WORTH CONTINUING WITH. LIP TO PULL IT OUT. THIS IS ROUGH, THIS THING HAS DRAWN BLOOD TWICE TODAY. BUT ONCE THEY COME OUT WE CAN INSTALL THE FLATHEAD PILOT THAT FITS IN WHERE THE OLD FLOATING GUIDE USED TO BE. AND THEN THE NEW SEAT, THEN DRIVE IT IN WITH A BEARING ERASE DRIVER KEEPING THE SEAT CENTERED AND STRAIGHT. NOW WE'RE READY TO DO THE VALVE JOB, WHICH COULD MAKE OR BREAK THIS BUILD. SO I'M JUST TOUCHING UP THE SAME SIZE EXHAUST VALVE THAT'S AN INCH FIVE-20. BUT ON THE INTAKE SIDE I OPENED HER UP FOR AN INCH SIX-20 HEAD DIAMETER. NOW TO DO THIS I FIRST NEED TO GO INTO THE THROAT WITH A 70 DEGREE CUTTER AND MAKE SOME ROOM. THIS WILL ALLOW ME TO FIT THE NEW THREE ANGLE CUTTER IN AND KEEP ME FROM CRASHING ALL THE TOOLING. NEXT I NEED TO DO A DESHROUD CUT UP TOP. NOW THIS WILL HELP KEEP THE AREA AROUND THE VALVE CLEAR FOR AIR AND FUEL TO MOVE THROUGH BETTER. THEN I CAN CUT IN THE ACTUAL THREE ANGLE VALVE JOB FOR THE NEW LARGER HEAD DIAMETER ON THE VALVE. NOW I LIKE TO LAP THE VALVES AS I GO ALONG. THIS WILL GIVE ME A CLEAR VISUAL OF WHERE THE SEAT AREA IS AND HOW CONCENTRIC EVERYTHING TURNED OUT. SO SHORT OF HONING THE MAINS AND THE CYLINDERS, WE'RE DONE HERE. WE'LL SEE YOU BACK IN THE SHOP. (ANNOUNCER)>> NEXT WE'RE INSTALLING CAM BEARINGS! NOW THIS CAUSES A SHORT SIDE RADIUS TO HAVE A HARDER TRANSITION, WHICH RESTRICTS AIR FLOW. SO BY USING A GRINDER AND A CARTRIDGE ROLL WE'LL SMOOTH IT OUT TO INCREASE THE INTAKE RUNNER'S AIR FLOW. AND THE EXHAUST SIDE GETS THE SAME TREATMENT. WE'RE ALSO MAKING A SMOOTH TRANSITION FOR THE AIR FLOW TO COME THROUGH THE CURTAIN AREA, WHICH IS BETWEEN THE VALVE'S FACE AND THE VALVE'S SEAT WHEN IT'S OPEN. (MIKE)>> WHILE JOHN CONTINUES PORTING, I'M USING A THREAD CHASER TO CLEAN EVERY TAPPED HOLE IN THE BLOCK. THE DECK TO SLIGHTLY SMOOTH THE SURFACE. IT SOUNDS CONTRADICTING BUT THIS WILL CAUSE THE GASKET INTO THE METAL BUT STILL SEAL. WE HAD OUR DOUBTS WHEN WE WERE TEARING THE ORIGINAL PISTONS OUT, BUT SEEING IT NOW AT 62 YEARS OLD, IT WAS WELL WORTH IT. FLATHEADS ARE KNOWN FOR RELEASING SAND FROM THE CASTING PROCESS EVEN AFTER SHOT PEENING. SO WE'RE GOING TO SUBMERGE THE BLOCK IN OUR SONIC TANK TO ALLOW THE ULTRA SOUND WAVES TO RELEASE ANY MORE CONTAMINANTS FROM THE BLOCK. AFTER THE FINAL WASH WE'LL BE READY TO ADD SOME COLOR ON THE INSIDE. NOW WE MADE SOME WOOD PLUGS OUT OF DOWEL TO PROTECT THE LIFTER BORES. WE'RE USING A RED INSULATING VARNISH. IT SHEDS OIL, WHICH PROMOTES FASTER OIL DRAIN BACK TO THE PAN. IT WON'T CHIP AND IT'S CHEMICAL RESISTANT. ON THE OUTSIDE A SMOOTH COAT OF DUPLICOLOR GRAY ENGINE PRIMER. THIS WILL GIVE US A GOOD BASE FOR THE FINAL COAT TO ADHERE TO. FOR THAT THEIR HIGH TEMP RED ENGINE ENAMEL WITH CERAMIC. NOW THE BLOCK WILL GET SEVERAL COATS TO GIVE IT A LOOK THAT ANY OLD TIMER WOULD APPROVE OF. (JOHN)>> LOOKS LIKE PICASSO HIMSELF PAINTED THIS. (MIKE)>> WITH THE BLOCK DRY, THE CAM BEARINGS ARE THE FIRST NEW PART TO BE USED. WE'LL USE OUR GOODSON BEARING SCRAPER TO DEBURR THE BEVEL ON EACH SIDE OF THE BEARING. DOING THIS ELIMINATES THE CHANCE OF ANY ROUGH EDGES BEING ROLLED INTO THE BEARING AS THE CAM IS INSTALLED. MAKING SURE THE OILING HOLES ARE ORIENTED CORRECTLY, TAP THE BEARING INTO PLACE. NOW WE CAN SPRAY A LIGHT COAT OF WD 40 ON THE CAM'S JOURNALS AND TEST FIT IT. NOW IF IT TURNS NICE AND EASY WITHOUT ANY TIGHT SPOTS, WE KNOW THE BEARINGS ARE IN STRAIT AND THE CAM'S LINE BORE IS STILL IN SPEC, AND IT IS. (JOHN)>> WHOO, LOOK AT THAT, THAT'S WHAT WE'RE LOOKING FOR. NOW I KNOW INSTALLING CAM BEARINGS AND TEST FITTING CAM SHAFTS CAN BE PRETTY INTIMIDATING. I KNOW A LOT OF GUYS THAT NO MATTER HOW SLOW OR SOFT THEY TRY TO PUT THEM IN, THEY ALWAYS END UP WITH SOME KNICKS. WELL I DO TOO AND IT'S NOT THAT BIG OF A DEAL. BELIEVE IT OR NOT THE BEARING IS A LOT STRONGER THAN YOU THINK IT IS. BUT IF THEY BOTHER YOU LIKE THEY DO ME, I'LL SHOW YOU A LITTLE TRICK. NOW WITH SOME LIGHT PRESSURE AND A LITTLE GRAY SCOTCHBRITE, JUST RUB IT UNTIL IT CLEANS UP. REMEMBER, IT'S NOT THE SIZE OF THE PEN, IT'S HOW YOU WRITE YOUR NAME WITH IT. (MIKE)>> FLATHEADS ONLY USE ONE OIL GALLEY PLUG. IT'S LOCATED AT THE FRONT OF THE ENGINE. HOT RODDING CRAZE. IF YOUR ENGINE IS LOW ON POWER OR IF YOU'RE TAKING CARE OF THE MOSQUITO POPULATION IN YOUR NEIGHBORHOOD DUE TO OIL SMOKE, THIS IS FOR YOU. IRON RING SET, AND ALL THE GASKETS YOU NEED FOR REASSEMBLY. NOW AT $88 BUCKS WHAT ARE YOU WAITING ON. WE SHOWED YOU A BUNCH OF TIPS AND TRICKS TO DO TO YOUR BLOCK. SO GET MOTIVATED, GET IN THE GARAGE, AND GET IT DONE. (JOHN)>> HAVING THE BEST TOOLS HERE IN THE SHOP REALLY MAKES OUR LIFE A LOT EASIER, AND MATCO HAS GONE ONE STEP FURTHER WITH THEIR NEW DUAL OFF SET COMBINATION WRENCH SET. NOW THIS IS A METRIC KIT THAT GIVES YOU SIZES FROM EIGHT MILLIMETER TO 19 MILLIMETER. THEY WERE DESIGNED FOR IMPROVED ACCESS IN TIGHT AREAS WITH A NARROWER OPENED END AND A 30 INDEX, AND A BOX END THAT'S INDEXED AT 15 DEGREES. NOW THEY STILL WORK ON THE STANDARD SIX AND 12 POINT FASTENERS, BUT THEY'LL ALSO GRAB A HOLD OF A TORX, SPLINED, OR SQUARE HEAD FASTENER. NOW THE BEST PART ABOUT THESE GUYS IS YOU COULD HAVE A NUT OR A BOLT THAT'S ROUNDED OFF UP TO 70 PERCENT, THESE THINGS WILL STILL GRAB A HOLD AND TAKE IT OUT. SO IF YOU'RE INTERESTED GET A HOLD OF YOUR LOCAL MATCO DEALER. 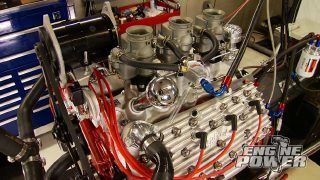 (MIKE)>> HOW WOULD YOU LIKE YOUR RACING CARBURETOR TO PERFORM AT OPTIMUM LEVEL AND YOUR ENGINE MAKE MAXIMUM HORSEPOWER? WELL NOW YOU CAN WITH RTWOC PERFORMANCE'S CFD 41-50 AIR CLEANER BASES. NOW THIS THING IS DESIGNED TO IMPROVE THE AIR FLOW ENTRY INTO A 4150 CARBURETOR, REDUCE RESTRICTIONS, AND GIVE A STRONGER AND MORE CONSISTENT BOOSTER SIGNAL. NOW IT'S DESIGNED TO RUN ON LATE MODEL AND MODIFIED RACING ENGINES, COMES WITH THREE DIFFERENT CARBURETOR BASES, AND ONE 14 INCH AIR CLEANER BASE. 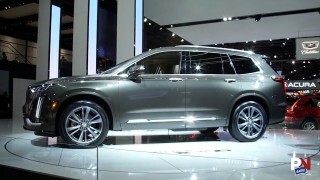 YOU CAN PICK YOURS UP AT SUMMIT RACING FOR RIGHT AT $230 BUCKS. WELL THAT'S IT FOR THIS WEEK, WE'LL SEE YOU NEXT TIME.